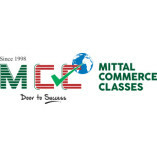 Mittal Commerce Classes, established in 1998... , with the only purpose of helping commerce student to reach their Goal. The country with around 1.34 billion population, has only 2,81,193 CA professional.We could understand the negative myth wrapping around commerce student and discouraging them to opt for professional courses under this stream .We took the initiative to help in building a balance of accountants, by creating confidence and determination in the students, by providing exclusive and comprehensive study pattern to them. With help of advanced technology and experienced staff , we are successfully training students to pave their way to glorious and propitious future. We take opportunity to thank all the student,parents teacher who have bestowed trust and confidence in us,and making this institute one among” Best CA Coaching Institute of India’!! !